Pervez Musharraf is America ’s favorite dictator. The Bush administration seems to consider the Pakistani general -- who took power in a 1999 military coup -- an indispensable ally, and has yet to publicly pressure him on the democracy front. Democrats and foreign policy thinkers of the "realist" school seem equally comfortable with the idea of Gen. Musharraf running Pakistan for the indefinite future. Indeed, if the purpose of the general’s new autobiography -- "In the Line of Fire" -- was to win American sympathy ahead of an attempt to fiddle with next year’s presidential election, he probably needn’t have bothered. A recent meeting of the Musharraf fan club took place at the Council on Foreign Relations in New York , where Gen. Musharraf gave brief remarks and took questions as he launched his book tour on Monday night. He was treated to standing ovations that exceeded mere politeness as he entered and left the hall. Not one questioner raised the democracy issue. And if the moderator -- former Clinton Treasury Secretary Robert Rubin -- was curious, he didn’t let on. He was too busy extolling Gen. Musharraf’s wisdom and the fact that he has been kind enough to employ as prime minister Mr. Rubin’s ex- Citi bank colleague, Shaukat Aziz . Even among the "neocon" architects of President Bush’s democracy-promotion agenda it’s hard to find an unkind word about Gen. Musharraf, as I discovered while spending several days last year in Islamabad with former Undersecretary of Defense Doug Feith. Behind this bipartisan support -- or at least acceptance -- is Pakistan ’s nuclear arsenal, and the perception that Gen. Musharraf is the only thing standing in the way of its takeover by a radical Islamic government. But there are good reasons to doubt this perception, and to suspect that allowing a permanent "Musharraf Exception" to the democracy agenda will do more harm than good. On the plus side of the Musharraf ledger is, indeed, the obvious fact that the man with the keys to Pakistan ’s bombs is not a raving Islamic fanatic. He has been an ally -- of convenience, at least -- in the fight against al Qaeda. And his rule, while autocratic, is not oppressive. With a smart and vibrant free press, Pakistan undoubtedly passes what Condoleezza Rice has called the "public square test" -- a fancy way of saying you can speak your mind without fear of being carted away by the cops. At the same time, however, Gen. Musharraf suffers from his lack of legitimacy among the secular classes who have run Pakistan ’s democratic governments in the past, and who would almost surely win if another free poll is held. The Islamists got only 11% in the last parliamentary election, but the general is increasingly courting them as he attempts to hold power -- which may be one reason his antiterror efforts haven’t included any attempts to crack down on the madrassas. For the same reason, Pakistan ’s efforts to control Taliban elements operating within its borders seem half-hearted. And when confronted with a question about this at the Council Monday night, Gen. Musharraf launched into an ethnocentric diatribe about supporting Afghanistan ’s Pashtun majority. Never mind that Afghan President Hamid Karzai is a Pashtun. Gen. Musharraf went on at length about the apparently unseemly fact that the late anti-Taliban leader Ahmed Shah Massoud -- a "minority" Tajik, he kept pointing out -- is revered in Kabul . More broadly, Gen. Musharraf used his Council on Foreign Relations remarks to criticize the Bush administration’s broader war on terror. "I feel that we are only using the instrument of the military to combat terrorism," he said, ignoring the democracy agenda. And what does he think the root cause of terrorism is? " Palestine is the core issue," he said, repeatedly. The audience could have been forgiven for thinking it was listening to the tired rhetoric of someone like Hosni Mubarak. But then, Gen. Musharraf seems increasingly like Mr. Mubarak, and less like the modernizer preparing Pakistan for a return to democracy that he claims to be. Don’t get me wrong. Your humble correspondent is under no illusions about the feasibility of immediate democratic revolutions in every country of the Islamic world. But equally, let’s have no illusions about Pervez Musharraf. He took power illegitimately in a country with some history of democracy, however imperfect. And now he seems to be in no hurry to give it up. 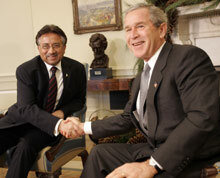 The Bush Doctrine can survive the Musharraf Exception over the short run. But over the longer term, the credibility of our efforts to address the root causes of terror will require nudging Pakistan , too, back toward the democratic path. Mr. Pollock is a member of the Journal’s editorial board.